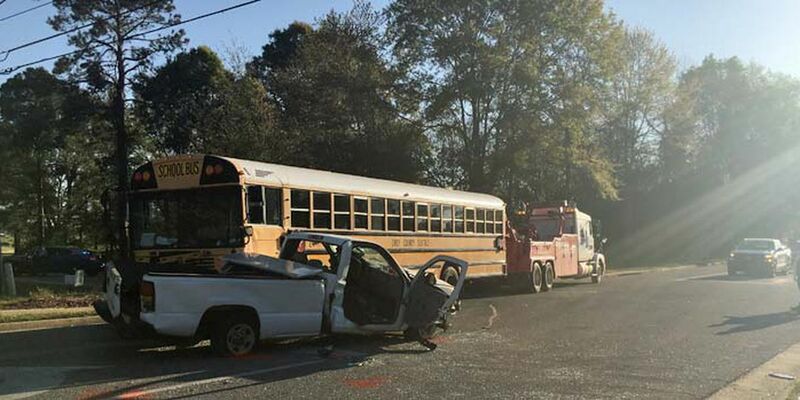 CORDELE, GA (WALB) - Crisp County Coroner J. D. Rainey Jr. confirmed Friday morning that there was a fatality resulting from a collision between a truck and a school bus, near the intersection of 24th and Greer St. in Cordele. About 11:30 Friday morning, Rainey said the family has been notified, and the victim is Joel Lee Hodges, 28. He was not sure if victim was from Cordele, but he had a Macon address on his driver’s license, and the body has been sent to Macon. The wreck happened a little after 7:00, when the driver of the truck failed to yield at this intersection, according to law enforcement. There were 13 people aboard the bus, 11 students, the bus driver and bus monitor. There was also a passenger in the truck, and a helicopter transport was called in to transport that person for treatment. Another vehicle was in turn lane preparing to turn left on Greer, but the driver sustained no injuries there that vehicle already removed from scene. Troopers were on scene about two hours.